Just a week ago, a cryptocurrency exchange in Japan got hacked again, losing over $60 million worth of coins. Just the first half of 2018 alone, Japan has already lost around $540 million to hacking. About 95% of $540 were lost through exchanges and the rest through personal wallets. Whichever is the case, it has been proven that it is unsafe to be keeping coins either in exchanges or other online wallets. It is understandable that many people do not choose to keep their coins in hardware wallets simply because it is inconvenient. It is much better to be able to trade instantly right out of their mobile phones. Other reasons maybe also because hardware wallets are complicated to use so people are scared of losing control of their coins. ELLIPAL has created a hardware wallet that answers both of these questions. 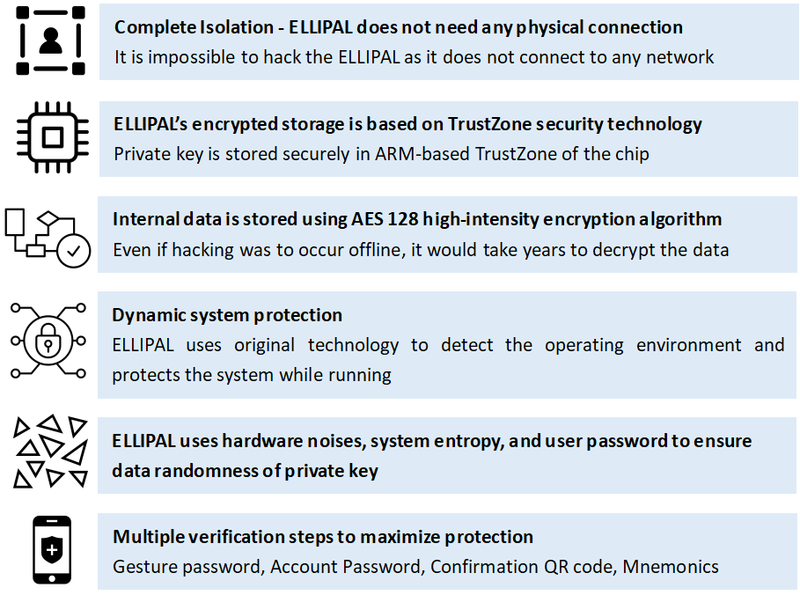 ELLIPAL is convenient, works with mobile phone and is extremely easy to use, not to mention it is impossible to hack. In this article, we will compare the newly released ELLIPAL with the current market leader — the Ledger Nano S.
Up to this point we can see that most of the Ledger’s function relies on PC to work. Operating with just two small buttons on the device can also take time to get used to. Moreover, configuration process takes time and is difficult. These cause many cryptocurrency investors choose not to switch to hardware wallet as it is inconvenient and complex. ELLIPAL solves this dilemma between convenience and safety by creating a hardware wallet that works with a mobile phone App and requires no complex setting up thanks to its state of the art security system. In the second part of the article, we will discuss about the security of both devices and how they keep private keys safe offline. In conclusion, the Ledger’s safety is well trusted and proven throughout the world. To match this, ELLIPAL has followed and developed its own unique security system that can protect the user from any hacking attempts while accommodating mobile support. One major difference though, is that ELLIPAL has no physical connection to the network whatsoever while the Ledger is physically connected to PC through the USB cable. This can protect the ELLIPAL from various forms of attacks that is possible through USB cables. While the Ledger has been here for longer and gained its well earned reputation, ELLIPAL is here to answer user’s needs that were not met by the Ledger with newer and more user friendly technology. With its QR code technology and mobile App support, using ELLIPAL is fast, efficient, safe and easy. These, apart from safe, are qualities that are rarely thought about when thinking of the Ledger. There is no doubt that ELLIPAL is the product that will contribute greatly to the block-chain community and become worthy partners (Pals) of many investors. ELLIPAL will continue to work hard to satisfy more needs and lead the way to a safer and better ecosystem. porfavor contestarme para poder comprarlo. he visto los tutoriales del ellipal y me ha gustado,mi pregunta es se puede pagar en bitcoin?y donde y como. got ela…are u going to support elastos? if i purchase neo and neo gas and store with ellipal i received the rewards at ellipal? if i am in a island or in a remote place ellipal will continue working? In the process of looking for a hardware wallet. The New Trezor Model T supports hundreds of tokens and dozens of networks including staking rewards. Will the Ellipal wallet be able to match ? Specifically Neo based tokens, ADA, Tron and Dash? Are you planning to support Elastos (ELA)? How abou Deep Brain Chain (DBC)? Do you support NEO tokens? Not looking to buy hardware wallet at the moment? Stay in touch with us! ELLIPAL Limited is a block-chain technology company with a focus on cryptocurrency users. ELLIPAL is founded in 2017 and headquartered in Hong Kong. ELLIPAL's mission is to "Connect everyone safely and conveniently to the Block-chain" and to build a community for block-chain users and projects.